During harvest, the members of the cooperative are automatically credited of the exact amount of kilogrammes that they deliver to the cellar. Grapes delivered are stored on stainless “conquets”. The minimal degree required for the grapes is 14°8C for "Vins Doux Naturels" ( AOC) and 12 °C for "Muscat Sec" (Vin de Pays d'Oc). "Châteaux" and "domaines" are converted into wine separately. 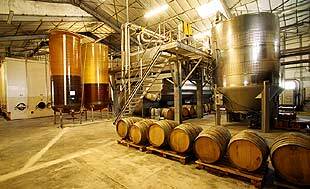 Our cooperative owns three pneumatic wine presses that have each a capacity of 20 tons. They use a central membrane that inflates to very delicately presses grapes without crushing. There are four steps of pression from 0.5 to 1.5 bars. Those V.D.N. 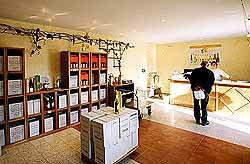 (Vins Doux Naturels) are made in a more selective way than the traditional method. As soon as they are delivered, grapes are visually selected according to their general appearance. Grapes‘s skins have to be intact. Then, grape berries are separated from their stem before they are either transferred to stainless vat or let into the press for a maceration process called “Skin maceration”. In fact, grapes contain a lot of aromas, which can be kept on the juice if grapes macerate at least one night. The drained grapes are then pressed very delicately in order to obtain two juices that are assembled, cooled, cleaned and put into a fermentation vat. Musts are taken out from press and cooled around 4°C to facilitate “racking”. This process allows to separate must deposit from the quality “clear” juice. After 24 to 48 hours, the “clear” juice is put into fermentation in stainless vat. Ferments turn sugar into alcohol. It's a natural process. This stage lasts from 4 to 8 days. During fermentation, temperature increases. All have to be carefully monitored. If the temperature is too high, aromas evaporate. To preserve aromas, vats have to be cooled. Temperature is maintained at 18°C. This is a delicate making that allows to obtain very fruity and flavoured Muscats. Temperature has an important role in winemaking. The temperature decrease of grapes, musts and wines is essential to preserve the strength of muscat’s aromas. Before winemaking, grapes are cooled and inert natural CO2 is added. Musts are cooled from 18 to 20°C before and during fermentation. For Vin Doux Naturel, law forces to stop fermentation by adding pur alcohol (5 to 10% of the global vat’s volume is added on musts during fermentation). This process has to be very precise in order to keep more than 125 g of sugar per litre in the wine. We use a 97% alcohol “without flavour”, coming from wines distillation..